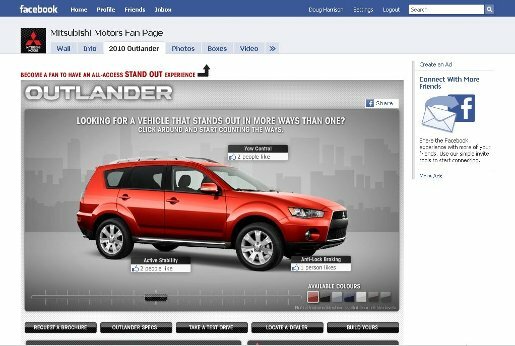 Mitsubishi Canada is promoting the 2010 Outlander as the vehicle that stands out in the traffic, with “Stand Out”, an integrated multimedia advertising campaign. Television (Invisible), print, direct mail, cinema and online advertising connect with a Facebook fan page. 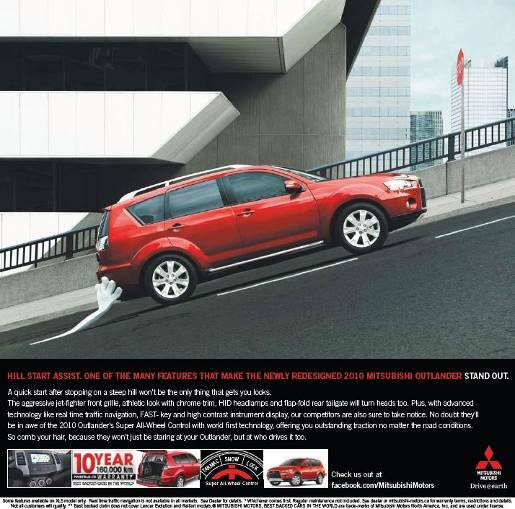 Nothing stands out on the road quite like the new redesigned 2010 Mitsubishi Outlander. Pedestrians, drivers, cars, bikes and bikers are all minimized in comparison with the red Mitsubishi driving through the city. 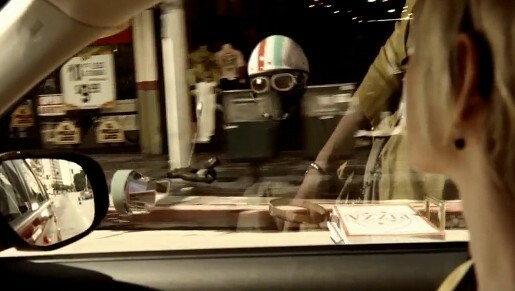 The campaign features a variety of invisible people going about their daily lives partaking in an variety of activities such as skateboarding; sitting in a coffee shop and walking along the street with a stroller. Only their clothing and shoes are visible while the rest of their bodies are invisible. Colour treatment is primarily a sepia hue until the camera pans to reveal the 2010 Outlander, in glorious colour, parked by the curb. A young couple enters the vehicle and their bodies instantly become apparent. The rest of the spot shows the Outlander driving through city streets, clearly differentiated from the sepia surroundings, and constantly admired by passers-by. Supers reference the three key new features of the vehicle: Super All‑Wheel Control; Hill Start Assist; Available HDD Navigation. 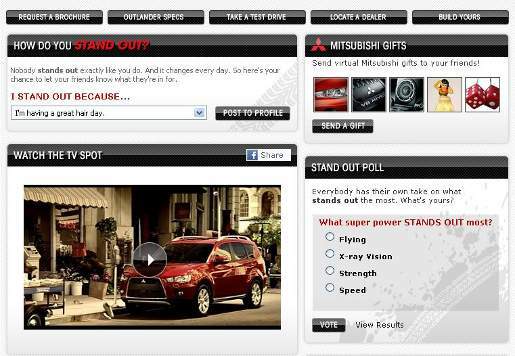 The spot ends with the Mitsubishi Drive@earth signature pointing viewers to the Facebook URL. Online, banner ads, print and direct mail are also being used to support the campaign, driving consumers to visit the Facebook URL. The Invisible campaign was developed at BBDO Toronto by creative directors Carlos Moreno and Peter Ignazi, and agency producer Dena Thompson, in collaboration with Proximity Canada. Filming was shot by director Filip Engstrom via Smuggler and Soft Citizen, Toronto, with director of photography Linus Sandgren, executive producers Eva Preger and Jeffery McDougall. Post production was done at The Mill, New York, by producer Camila DeBiaggi, shoot supervisor Yann Mabille, Flame artist Naomi Anderlini, additional Flame Alex Lovejoy, Flame assistant Keith Sullivan, combustion/Flame assistants Albert Cook, Melissa Graff, Anu Nagaraj, lead 3D artist Yann Mabille, 3D artists Alexander Horton, Jasmine Katatikarn, Jeffrey Dates, Bill Dorais, Andres Eguiguren, Christopher Bott, Michael Panov, Andrew Proctor, Robert Petrie, Emily Meger, Alek Vacura and colorist Jamie Wilkinson. Sound design and audio post production was done at Pirate, New York, by sound designer Dave Rivera, sound designer/mixer Gary Tole, creative director Tag Gross and executive producer Bob Montero.